Rediscover the Essential You. Be nourished body, mind and spirit through calm and rejuvenating yoga practice focusing on aligning breath with movement to maximise the effectiveness of your yoga practice. Experience hatha and yin yoga sessions, wellness workshops, relaxation, mantra chanting and meditation. 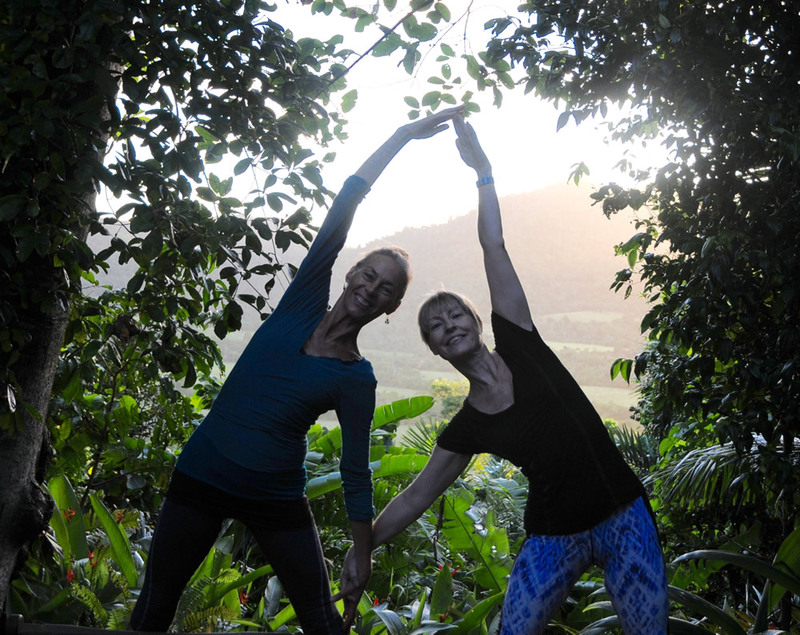 Enjoy the beauty of the rainforest, delicious healthy food and connecting deeply with yourself and others – sharing in another of Jane’s life affirming retreats. Jane is an IYTA teacher with 20 years experience, and loves creating the opportunity for students of all ages to feel inspired, revitalised and at ease. Jo is a Yin Yoga teacher and a life and wellness coach with a passion for helping others to live the life of their dreams. Retreat offers the perfect opportunity for you to deepen your yoga practice and take some valuable ‘time out’ to regenerate. It is also the opportunity to enjoy the company of others in this very beautiful and relaxed setting. The Sanctuary is located up in the rainforest overlooking the ocean below. There are walking tracks down to the beach where you can swim and walk – and, if you are lucky, you may meet the resident cassowary! There is a large relaxed and comfortable open plan dining and lounge area surrounded in decks, and accommodation varies from basic huts (with walls of fly screen) in the forest, alfresco huts which include outdoor shower and toilet facilities or fully contained deluxe cabins. The meals provided at the Sanctuary are generous, healthy and very delicious. Yoga will include a variety of yoga postures, pranayama (breath awareness and exercises), meditation, deep relaxation, discussion around yoga topics and fun with mantra and chanting!! Yoga sessions will be suitable for all levels of experience. Massages are available at the Sanctuary on request. Numbers are limited, call Jane now to make your booking. Costs are all inclusive of three days accommodation, all meals and full retreat programme. Prices are per person. Below prices are all inclusive of two nights accommodation, all meals and retreat programme. Prices are per person. All huts are fully screened set in the rainforest, so you have a view of the canopy above. Cabins are contained with balconies overlooking the rainforest. There is a beautiful communal area with relaxed seating, restaurant, bar and balcony looking out over sweeping views of rainforest and ocean – great place to relax in a hammock and from which to watch the sun rise!! Yoga takes place in a lovely studio set in the peaceful surrounds. * If you would like additional information about the retreat please follow me on facebook as I will be posting updates. I recently attended a weekend yoga retreat co-hosted by Jane. Held amidst a tranquil rainforest setting, it was exactly what I needed to recharge and find my self again. Jane is a wonderful yoga teacher who exudes an aura of kindness, peacefulness and wisdom. Jane’s sessions were a combination of poses, movements, chanting and meditation which left me feeling peaceful, relaxed, yet energised. The retreat provided the perfect grounding, healing, teachings and motivation that I needed to get back on my path to better health and happiness. I am grateful for your time and energy you gave to us Jane, and I would thoroughly recommend to everyone! Thank you. Jane’s yoga retreat at Sanctuary Retreat Mission Beach was a wonderful experience. I am not as regular as I would like with my yoga practice and worried how I would handle 4 days of yoga, but Jane’s yoga style has a beautiful flow allowing you to determine your own pace. The meditation and education parts of the weekend were very informative and I learnt a lot. What a fantastic weekend Yoga retreat with Jane at the beautiful Sanctuary Lodge in Mission beach! A clever and gentle balance between relaxation, deep body and mind work, good company, amazing vegetarian food and beautiful surroundings. The perfect formula to a much appreciated weekend retreat! Thank you and I look forward to next years retreat! I expected to attend Jane’s retreat to get some relaxation time and healing for the mind and body. I achieved this and so much more. I met some wonderful people and had many sessions that inspired and crystalized what is important in life. It opened my mind to so many possibilities. Jane provided gentle guidance, understanding plus yoga that suited many different levels. And what amazing food. Thankyou. This was my first ever yoga retreat and I also do not practice yoga, however I will be now. I chose to do this retreat to help me work through a difficult time in my life, I walked away from this weekend having gained much more. Jane was an excellent teacher whom made us as a group feel comfortable and supported. The Sanctuary was beautiful, the food delectable! Jane the retreat was amazing,all the women were all so beautiful,you are amazing and made the retreat a memorable and life changing experience,I cannot put into words how I felt within myself during and afterwards,I enjoyed it so much,I definitely felt rejuvenated.The lodge is the most amazing place we’re you have opportunity to get back to basics away from the hussel and bussel of normal everyday life and the food amazing.I will definitely be back,thank you from the bottom of my heart for this experience,your yoga retreat was an amazing experience. It has been a truly wonderful, inspirational, relaxing few days. The venue is perfect. The food delicious. Thank you Jane for organising this amazing weekend. Now back to the real world but feeling ready for it. This weekend surpassed my expectations. Ten very different ladies came together in a circle and enjoyed life. I came to learn meditation and come away with a deeper knowledge. Jane did a wonderful job of guiding us on our journey, lots of discussions. stories and laughter. The hospitality was wonderful. Food nourishing and meals large. Thank you Jane I will definitely do this again.